The center has got a fully accessible library that can be accessed by the students, faculty and the research scholars who are doing their research in the area of Gender studies. SNCWS Library is fully computerized with help the KOHA open source library management software. It delivers user focused innovative information products, services and programs of the highest quality that are integrated with teaching, learning and research activities. The collection of library covers the latest information resources on all areas of women's Studies, Gender Studies, Human Rights Law and Education. The Library Services/ Facilities include Internet service, Online Database Searching Facilities, CD-ROM Services, Newspapers Clipping Services, Current Content Services, Current Awareness Services, Reference/ Referral Service, Reprography Service. 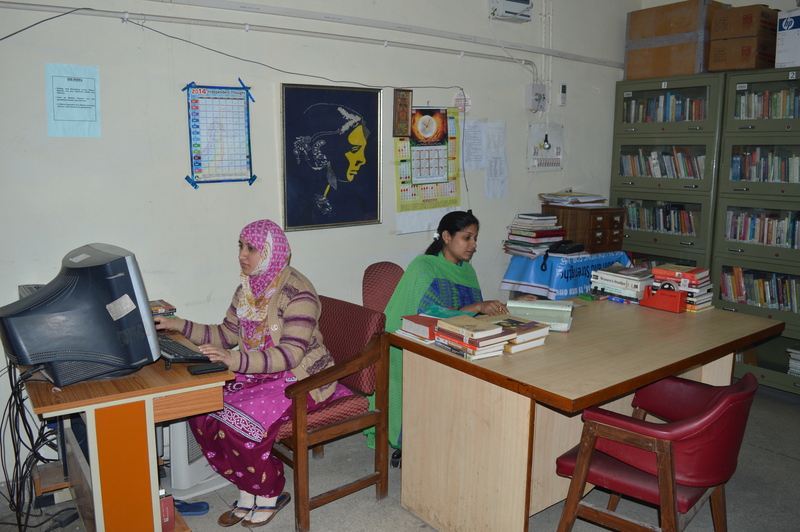 The library also provides compiled basic reading materials for students enrolled for the courses in Gender studies. The library has air conditioned reading area. About 15 users can use the library at a time. Text Books, general Dictionaries, Handbooks, Data books, Translated Material, Govt. of India Publications, Census reports, and year books are available in the library for ready reference. Newspaper Browsing Facility: The library subscribes two newspapers. The papers will be preserved for the 3 Months. The SNCWS Library services provided to users are given below. Books/ Periodicals Borrowing: Books in lending section are available for home reading for the period of one week (for students). Similarly, the back issues of current periodicals and their bound back volumes are available for borrowing. Overnight Borrowing: In addition lending books, students can borrow one to two textbooks in the reference section for overnight reading, which needs to return next day morning. CDs/Videos Borrowing: The users can borrow audio or video CDs/VCDs available in the library for short period. Lending service: Lending service is available to faculty, students, administrative, research and other staff members of JMI. Reprographic service: On request, photocopy/ies of the document/s available in the library may be provided subject to copyright restrictions. The Institute will determine the fee for this service from time to time.